The Royal Enfield Bullet with attachments can be used for tilling, weeding, and sowing. 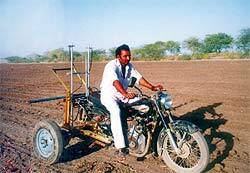 To solve problems in the spraying of agrochemi­cals in the fields, Man­sukhbhai Jagani farmer from Gujarat, India developed a sprayer which is effi­cient and affordable.This has been done with a die­sel Royal Enfield Bullet motorcycle complete with attachments for till­ing, weeding, and sowing small farm holdings. Jagani’s machine proves to be cost effective and fuel efficient. It can plow an acre of land in 30 min­utes, consuming just two liters of fuel. Santi can weed 10 hectares of land in a day at the cost of Rs 15 per hectare. To accomplish such tasks, Jagani has created an attachment that can be hooked to any 300+ cc motorcycle by replacing the rear wheel with an assembly unit, also designed and developed by him.